If your personal trainer resume is looking a little soft, check out these resume writing tips to help it tighten up. What kind of shape is your resume in? To be considered for top personal trainer jobs, resume expert Kim Isaacs says it helps to have a finely tuned resume. 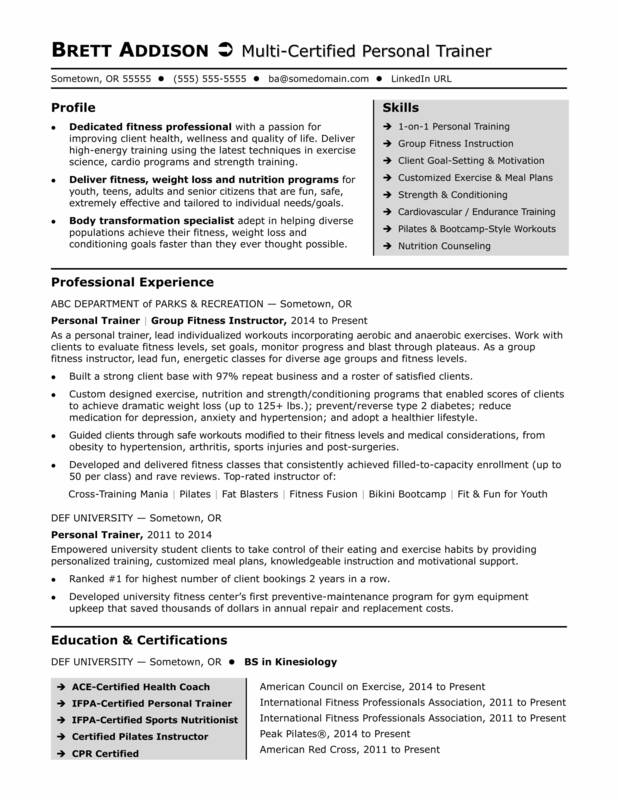 For resume writing tips, view this sample resume for a personal trainer that Isaacs created below, or download the personal trainer resume template in Word. Jobs for personal trainers are projected to grow by 10% (or 30,100 jobs) from 2016 through 2026, which is faster than average, according to the Bureau of Labor Statistics (BLS). You'll find the highest level of employment for this job in the following states: California, New York, Texas, Illinois, and Florida; and in the following metropolitan areas: New York City, Chicago, Washington D.C., Los Angeles, and Boston. As a personal trainer, you can expect to earn a median wage of $39,210 per year, or $18.85 per hour, according to the BLS. Additionally, you can learn about healthcare careers and search for personal trainer jobs on Monster. Dedicated fitness professional with a passion for improving client health, wellness and quality of life. Deliver high-energy training using the latest techniques in exercise science, cardio programs and strength training. Deliver fitness, weight loss and nutrition programs for youth, teens, adults and senior citizens that are fun, safe, extremely effective and tailored to individual needs/goals. Body transformation specialist adept in helping diverse populations achieve their fitness, weight loss and conditioning goals faster than they ever thought possible. As a personal trainer, lead individualized workouts incorporating aerobic and anaerobic exercises. Work with clients to evaluate fitness levels, set goals, monitor progress and blast through plateaus. As a group fitness instructor, lead fun, energetic classes for diverse age groups and fitness levels. Built a strong client base with 97% repeat business and a roster of satisfied clients. Custom designed exercise, nutrition and strength/conditioning programs that enabled scores of clients to achieve dramatic weight loss (up to 125+ lbs. ); prevent/reverse type 2 diabetes; reduce medication for depression, anxiety and hypertension; and adopt a healthier lifestyle. Guided clients through safe workouts modified to their fitness levels and medical considerations, from obesity to hypertension, arthritis, sports injuries and post-surgeries. Empowered university student clients to take control of their eating and exercise habits by providing personalized training, customized meal plans, knowledgeable instruction and motivational support. Ranked #1 for highest number of client bookings 2 years in a row. Developed university fitness center’s first preventive-maintenance program for gym equipment upkeep that saved thousands of dollars in annual repair and replacement costs.